"The authority Leary claims is that of revelation. He has repeatedly made the heroic trip inward to the everlasting world, to the shut palaces of the mind. He has ridden his acid funicular up Everest and gone to hell in a handcart, to the vast inward and abyss which is bounded only by the limits of human desire and human revulsion. And he has returned with messages." "The most cynical will find this book entertaining and enlightening, concerning one of the most controversial and misunderstood subjects of the day." 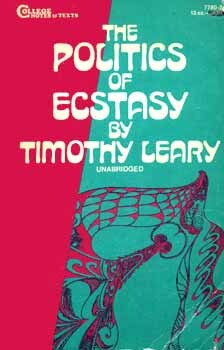 "When dr. Tim combines his scientific background with his Celtic powers of persuasion in The Politics of Ecstasy, one is almost ready to try a 'magical mystery trip'." "During the past several years, Leary has influenced a generation of young people more profoundly than has the President of the United States . . . taken head-on this is an amazing book, marvelously readable, stimulating." "Leary's books are eminently readable and reveal that Leary has surprising literary style."